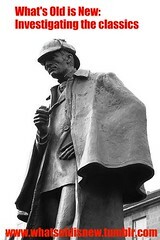 Sherlock Holmes on the trail of Jack the Ripper. Enough said. Honestly, I’m not really sure what other synopsis to add to that, that is pretty much what you need to know. Essentially, this is a Holmes pastiche (new vocabulary I learned from Graham Moore! ), in other words, a work not by Arthur Conan Doyle with Sherlock Holmes as the main character, doing what he does best: solving crimes. If you need more Sherlock-lit in your life (and, the Sherlock Holmes edition of What’s Old is New, I think I do), this is an incredibly entertaining one. Not entertaining in an ‘oh, isn’t this funny?’ way, but entertaining in an ‘I wish Sherlock Holmes was real, because then just maybe somebody would have actually solved the Jack the Ripper crime. Faye wrote in a convincing Watson style with a very engaging Holmes. She also had prose lovely enough that I was occasionally moved to stop reading and tweet sentences – that is always a good sign. I just picked this up after reading about it in another of your posts. Glad to see you liked it! I’m with Sandy. I can’t resist a book about Jack the Ripper!